Old-fashioned Boiled Cider Pie is a delightful Fall treat. This pie has a smooth and delicate filling with a mild apple flavor and (even though it contains no milk) a lovely custard-like texture. This recipe is from a 1905 cookbook published by a church in Berwick, Pennsylvania. I found the cookbook last summer when I was visiting the area in Central Pennsylvania where I had lived as a child. My husband and I were to meet someone for lunch – but we finished a visit with another friend earlier than anticipated. So when we saw that a tiny country church was holding a rummage sale, we decided to stop in to fill the time. There was a sign which said, “Donate whatever you think the items you select are worth.” I was immediately drawn to the book table. There were lots of colorful cookbooks from the 1960s and 70s on the tabke. But then I noticed an a small dog-eared cookbook with pages browned by age. I gently flipped through the book. Several pages were missing. But I could tell that it was old, really old; and that it was a church cookbook compiled by women in the nearby by town of Berwick. My heart beat a little faster. I really wanted this book. But there was no price. I was to donate whatever I thought it was worth. I dug into my wallet, and pulled out a $1 bill, a $5 bill, and a couple 20’s. I said, “I like old cookbooks” and walked out to the car. The woman obviously felt like I paid more than enough for the items I bought. Yet I’ve felt a little guilty ever since. To me, the hundred-year-old cookbook was a find worth much more than what I paid. Should I have made a larger donation? Put the cider in a saucepan, and bring to a boil using medium heat. Reduce heat and boil gently until it is reduced to approximately 1/2 cup (about 45 minutes). Stir frequently. Remove from heat. Set aside. Preheat oven to 350° F. Put egg in mixing bowl and beat until smooth. Add sugar and flour; stir until combined. Then stir in the water and boiled cider. Put in pic shell and place in oven. Bake until the top is lightly browned, and the filling does not move in waves. (This pie takes a long time to bake. Start checking it after 45 minutes, but don’t be surprised it it takes more than 1 1/2 hours for the filling to thicken.) Remove from oven. Cool pie before serving. Posted on October 29, 2017 October 29, 2017 by SherylPosted in FoodTagged cider, pie, recipe. I think you paid a fair price. Is the cider the unfermented variety? Yes, I used the unfermented variety. Wow, that looks delicious. I remember growing up and visiting the cider mill in the Catskill Mountains. I miss that original traditional flavor in Florida. That was a good buy! Like you, I remember an old-time cider mill that made the “real” thing. I love the complex sweet astringent taste of unpasteurized, cider, but it’s difficult to find these day. I have never heard of that kind of pie. The best part of Fall in Central PA was going to the apple orchards and getting cider, usually there was free samples, and apples. Agreed – There are some wonderful apple orchards in Pennsylvania. There’s a wonderful cider mill in Kansas I’ve visited a couple of times. 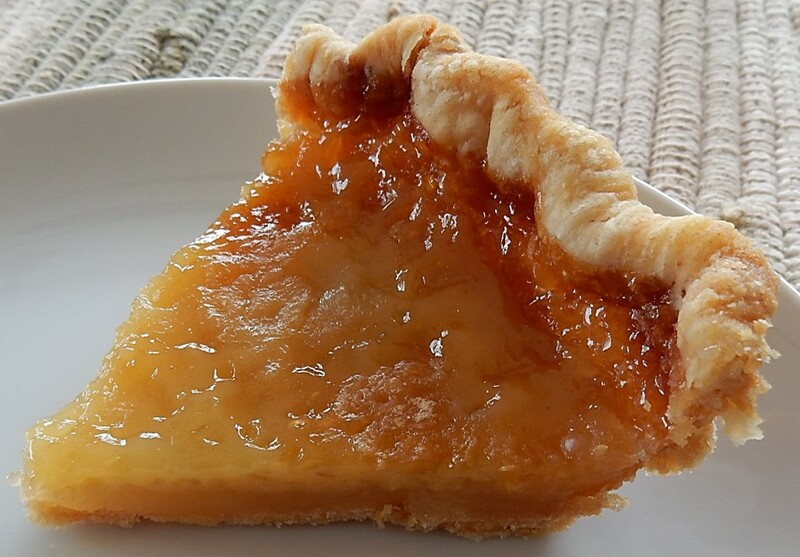 There’s nothing like fresh cider, and I can imagine how perfect the taste of this pie is. I have a friend who loves old recipes and old cookbooks, and I’ve already called her to ask if she’s ever made this. She’d never heard of such a thing, and I’m going to pass this one on to her. It’s a fun pie to make. I’m intrigued by how they made pies using the simplest of ingredients a hundred years ago. Sounds fair to me especially since the book needed a special owner like you who would actually bring the recipes back to life! Thanks – you’re making me feel better. I have so much fun searching through old cookbooks, and then trying recipes that intrigue me. What a unique recipe, and great find on the cookbook! I’m sure for the condition it was a fair price to pay. I think that you’re right. The cookbook sure doesn’t look like much – but sometimes the most interesting recipes are found in old books like this. That’s a great find! I think your donation was fair, especially since the book missed a few pages, and it would not be of much use to most people. Thanks for the link. I want to do some more experimenting with boiled cider. It’s an intriguing, flavorful sweetener. If the church was happy with your donation, you should be happy too. And what an interesting recipe! That’s a good way to think about it. Thanks! my friend read the recipe and thinks it would be good for a base for an apple tart tartin? mmm . . . I think that it might make an excellent base for an apple tart. It would be fun to experiment with this recipe. What a cool find!!! Gosh, that was so lucky. And the recipe looks unique and yummy. I love all old cookbooks – but old community and church cookbooks are my absolute favorites. Since most cooks shared their favorite recipes in these cookbooks, they provide not only a wealth of great food ideas, but also insight into which foods people in an area actually ate. I agree, which is why I love your blog! I’m glad the cookbook landed in your hands , old treasures are meant to fall into the hands who love them. 🙂 the pie sounds wonderful! I like how you said that. I worry that so many old treasures are being lost, and do value the old cookbooks and other vintage items that I have. Did this make two pies like the original recipe? If you made one pie, did you try using less cool water to speed up the baking time? I actually made 2 pies – like described in the hundred-year-old recipe; however, the pies seemed rather thin (and small), so I think that if I made this recipe again that I’d use a larger pie pan and put all the filling in one pie shell. I followed the old recipe and added the amount of water it called for, but it might be worth experimenting with the use of less water. Like you, I wondered why the recipe called for so much cool water. It seemed like I first boiled off much of the water in the cider, and then I added it back in. Thanks for finding this recipe. It looks yummy. Similarly to you, I’d never heard of Boiled Cider Pie until the saw the recipe in the old cookbook. I think old cookbooks are enchanting. I almost feel like you rescued the books from the description and the cashier’s reaction. Well done! Your pie looks mighty tasty. I’ve never heard of a boiled cider pie. Thanks for sharing about it and the recipe. I hadn’t thought of it quite that way, but you may be right. I may have rescued the book. That definitely makes me feel better. Thanks! You know, King Arthur Flour makes a boiled syrup. I’m betting that it could be used if for whatever reason you didn’t want to reduce your own. I hadn’t known about the King Arthur Flour boiled syrup. I’ll have to look for it. Love those moments of rushing to the car, thinking that someone may stop you and say, “hey wait!” Happened to us once when we bought a hundred year old pocket watch. This pie sounds delicious. It’s amazing the things that sometimes can be found at rummage sales. This looks amazing and simple. Thanks for sharing. You’re welcome. It’s a nice recipe. What an interesting idea for a pie, and lucky you for stopping at the rummage sale. I may need to try this one. I collect old cookbooks myself so I bet I’d have picked up the same one. So wonderful of you to bring back the days of old through cooking. I have a lot of fun finding, making, and writing about the old recipes. It’s wonderful to hear that you enjoy reading about the cooking in days gone by. What a neat find. Are you planning to try more of the recipes in that old cookbook soon? I hope you will. Yes, I’m sure that I will make more recipes from that book. It has a lot of intriguing recipes. Greetings to your little US Berwick cookbook from Berwick-upon-Tweed in the UK! Sounds like you got a little treasure with this old cookbook. I’m intrigued by the cider ingredient because in the UK, cider is fermented apple juice. Am I right in thinking that here cider is raw apple juice? Wow, it’s amazing that a regular reader of my blog is from a town in the UK with the same name as the town where the cookbook was published. I’m now curious about how Berwick in the U.S. got it’s name–and whether some people from Berwick-upon-Tweed moved there. Yes, the cider I used in this recipe is unfermented cider. It is made from pressed apples, and is is a little thicker than filtered apple juice. Isn’t the internet wonderful (despite all its faults) that we should be able to make the connection from my home in Berwick to your old home of Berwick in the US! I am always moved when I find familiar names in places like US and Australia to those I know in our locality – you just have to be amazed at the courage of the people who made those long journeys to start new lives in unknown places. It reminds me that while I in my retirement am so comfortable here – with plentiful food, good health services, warmth and a secure roof over my head – it was not so for generations and generations who lived here. Life was very hard – dangerous with local occupations of mining and fishing quite apart from the border raids from Scotland. And I bet it wasn’t at all an easy life when they arrived in those new lands either. It would be fascinating to find out more about the immigrants’ stories. Incidentally there is also a Berwick village in Sussex and North Berwick just up the coast from us in Scotland, but neither of them are as large a town as Berwick-upon-Tweed. It’s hard to imagine all the challenges people must have faced in days gone by as they traveled across the ocean to new homes. It’s amazing how many Berwick’s there are in the UK. It makes me wonder if there are multiple Berwick’s in the U.S.
That cook book was a great find! And the pie looks delicious. I’v heard of a lot of things, but never this pie. Thank you for the enlightenment. This was a new one for me, too. Until I saw it in the old cookbook, I’d never heard of a boiled cider pie. Yes, nuts or dried fruit, etc. could easily be added to this. What an interesting twist! This sounds perfect for the cooler weather we’re finally getting! It is a nice Fall pie. I have never heard of this pie! It looks delicious! Then I surely must give it a try! What an interesting pie. I love cider, so I have a feeling I’d love this. It does remind me of another pie they make in Central PA … I can’t remember what it’s called, but it’s basically pecan pie without the pecans. Hmmm. . . are you thinking of Shoo Fly pie? It’s not exactly the same, but maybe it’s somewhat similar. It’s a good Pennsylvania Dutch pie. I haven’t heard of Shoo Fly pie. Now I’m going to have to look it up. Just saw this. This looks good, I’ll have to try it.